What lies ahead for the National Residential Development Market? 2019 will continue to remain a difficult year for major Eastern Seaboard residential markets. With an expected turnaround across all states in 2020 and 2021. 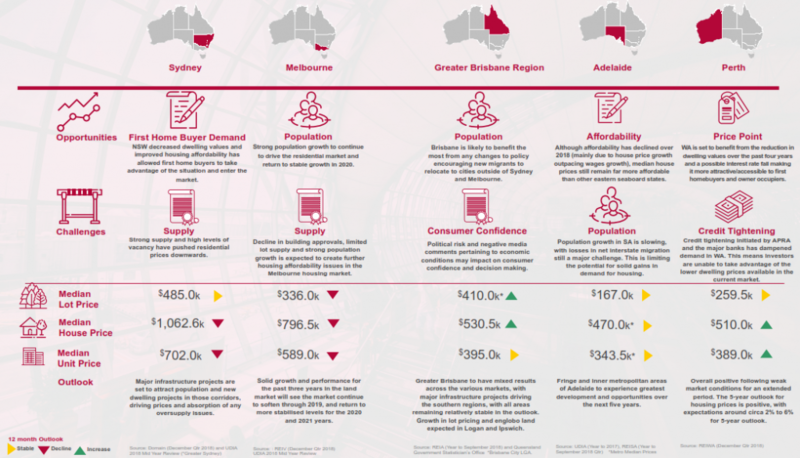 Infrastructure spend across the Eastern Seaboard together with population growth will drive residential prices and, in particular, the Brisbane greenfield market will experience steady growth off the back of infrastructure projects. The apartment oversupply experienced in certain market segments of Sydney will dissipate by 2021 with the outer ring expected to take longest to absorb the supply. Adelaide’s opportunities lie within the fringe and inner metropolitan areas with a shift in housing preferences. With land values in Perth already starting to rise, it is anticipated that growth in house and unit prices will be positive over the short-term. Steady growth is forecast over the five-year outlook. The key challenges facing the residential property market are likely to dissipate over 2020, with uncertainty regarding the federal election being resolved, the royal commission findings and consequences being released, and median dwelling prices and supply coming back to a more sustainable level. A Federal Election, the release of findings and actions from the Banking Royal Commission, global economic uncertainty, falling asset prices and rising vacancy in some markets are set to weigh heavily on the residential market in 2019. With global and political risks likely to be easing, the second half of the year should, however, start to see a stabilisation of the market. Vacancy should start to reduce again by year-end as supply levels continue to drop and improved affordability results in increased buyer demand. With market conditions starting to stabilise in early 2020, 2020 is forecast to be a year of improvement across most residential markets. Asset prices are forecast to rise after a two-year hiatus in Sydney and volatility in Brisbane and Melbourne and continue to add to gains already achieved in Perth and Adelaide. The federal election and any changes to capital gains and negative gearing are a risk for the 2020 year. By 2021 any remaining oversupply is likely to have been taken up across most markets and the next construction cycle should be underway. If changes to migration policy are implemented, discouraging movement to the Sydney and Melbourne metropolitan areas, demand should be strengthening further outside these cities, in particular in Brisbane, Perth and Adelaide. Population growth is set to continue to grow at solid levels in Australia (around 1.5%) over the short- to medium-term. The Visa restrictions proposed by the Liberal Government in August 2018 are set to redistribute population growth to cities outside of Sydney and Melbourne. Depending on jobs, this would result in housing demand rising in the remaining capitals and larger regional cities. With 2019 expected to be a politically and economically challenging year and median prices expected to fall further in some markets, the RBA is likely to decrease the official cash rate, improving the affordability of dwellings. A turnaround in conditions in 2020 is forecast to result in increased impetus for rising rates. The improving economy should, however, offset the impact of the rise in cost of finance. Dwelling approvals decreased by 9.1% year-on-year to January 2019, led by falls in other dwellings (-18.5%), according to the ABS (March 2019). This is a symptom of falling demand across many markets and is set to continue over 2019. In terms of numbers, WA (-17.6%) and NSW (-13.1%) accounted for the greatest fall in approvals and Tasmania (12.8%) and ACT (65.9%) were the only States to see an increase. Falling residential supply is likely to keep vacancy in check over 2019, despite the expected weak demand. Unemployment is currently at just 5.1% for Australia (ABS (at January 2019). Over the course of 2019 this is expected to remain fairly stable overall due to potential job losses in the retail trade and residential construction being offset by job gains in health care and infrastructure construction. This is a positive for the residential market nationally as jobs growth builds investor confidence. Wages growth, cost of finance and prices are other key drivers of affordability.